North Dakota did it again. July oil production numbers for the state was another record high—and it was a BIG one. 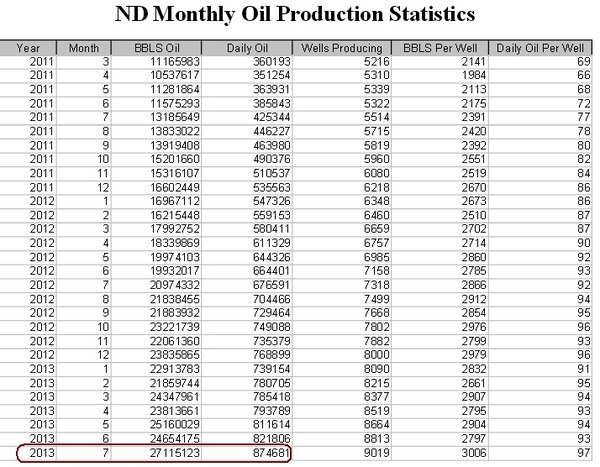 Monthly stats from the EIA (US Energy Information Administration) showed North Dakota production jumping by a whopping 55,000 barrels per day in July to reach nearly 875,000 barrels per day. This was one of the largest monthly increases that the Bakken has seen! Two factors caused this jump. First, wet weather had been holding back the completion (read: fracking) of wells for several months and a dry month of July allowed producers to quickly do some catch up. Second, producers keep getting more and more efficient with the wells they are drilling so when they are able to also get those wells quickly on production it makes a big difference. The incredible boom that is the Bakken oil story continues to roll along. 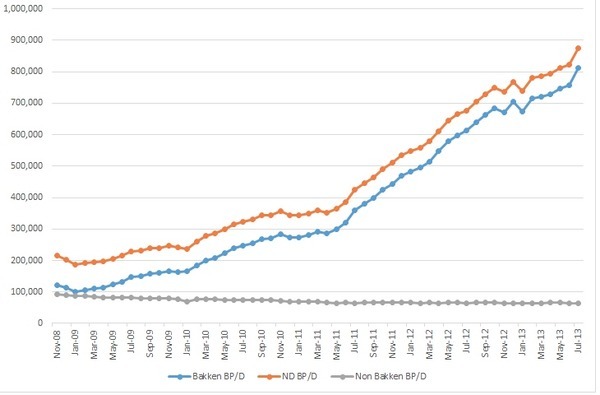 At the end of 2012, I wrote a story on: When will the Bakken peak? (You can read it here). For now, it looks like the answer is—a long way off. While production from the Bakken continues to set new highs every quarter, the performance of share prices of Bakken focused producers have been nothing to write home about. In fact, they just started to move in September, after two years of trading flat. After taking an interest in these companies in 2009 and 2010 the market has not been giving these companies much love, despite continued production growth. Part of the problem has been concerns over the discounted price that many of these producers had been getting for their oil as a result of the oil logjam at Cushing. Then producers started moving crude by rail—all over the US. The Bakken oil discount went away, but strangely, just as these stocks are starting to move up, the discount has widened again…though not to what it was. That hasn’t stopped money flowing back into Bakken producers. No exploration, no big money to be spent on acreage. These companies have already locked up the key acreage in the Bakken. Business for these companies is now all about going out and drilling these high quality, low-risk development wells in the middle of the Bakken. These companies are less explorers for oil than they are manufacturing operations. Now it is all about getting out in the field and drilling wells. And the more you drill, the better you get at doing it. With WTI oil prices just under $100, these Bakken producers are able to “mint” money and investors are starting to notice. If you are looking for a way to play the Bakken, the “best in breed” pure play on the Bakken in my coverage is Triangle Petroleum. 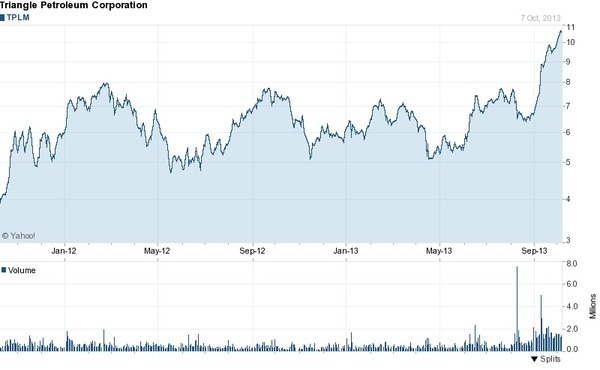 After two years of treading water Triangle’s stock price is finally starting to break out. Triangle has 95,000 net acres of land in total. 45,000 of those acres are in the Williams and McKenzie counties are in the North Dakota Bakken. The other 50,000 net acres are just across the border in Montana—on a property called the Station Prospect. Triangle’s North Dakota properties are fairly well de-risked. How productive and profitable the Station Prospect property will be is yet to be determined. On August 6 Triangle announced that it had acquired an additional 9,350 net acres and 1,150 Boe/d of estimated current net production (86% operated) in McKenzie County. This land is right beside Triangle’s existing land and increased its core McKenzie holdings to 45,000 net acres, current production to 5,650 Boe/d, and proved reserves to 22.9 million boe. This acquisition looks like a good deal for Triangle. Assuming that the 1,150 boe of production is worth $80,000 per flowing barrel, that means that the 9,350 acres were acquired for $1,500 per acre. In addition to those 45,000 “core” acres in McKenzie County, Triangle has 50,000 prospective acres in Montana which is known as “Station Prospect.” Activity in the Bakken is spreading northwest up into Montana, near where Station Prospect is located, which straddles Roosevelt and Sheridan counties. The company says it has 360 operated drill locations at Station Prospect—enough to keep them busy for a few years. The Station Prospect property is not a sure thing though as it is still unknown if profitable wells can be drilled on the property. What makes Triangle unique is that it is the ONLY small vertically integrated Bakken player. RockPile Energy Services is Triangle’s wholly-owned subsidiary that provides hydraulic fracking services to Triangle and third-party customers. “Fracking” or pressure pumping is what has made it possible to produce oil and natural gas in places like the Bakken where conventional technology is ineffective. Having its own fracking division means that Triangle doesn’t ever have to worry about a shortage of fracking services. This is a very real concern, especially for the smaller producers. The bigger producers like EOG or Continental Resources are huge customers for the services companies. If there is a shortage of fracking crews and equipment it will not be these big boys who miss out, it will be the smaller companies like Triangle left out in the cold. The bigger producers who are the service industries best customers also get first choice of the best equipment and crews. Having its own fracking service in-house not only guarantees access to the service for Triangle but also allows the company to have much greater control over costs and the quality of the work being done. In addition to Rockpile Energy Service, Triangle has its own Midstream subsidiary called Caliber Midstream. Caliber is a joint venture with First Reserve Energy Infrastructure Fund (FREIF) and was created in October 2012 with Triangle contributing $30 million and FREIF $70 million. Caliber benefits its customers by reducing the cost and environmental impact of trucking and also reduces or eliminates the emissions caused by natural gas flaring. Caliber began water transportation and disposal operations in January 2013 and expects to have all business lines in service by the third quarter of fiscal year 2014. Triangle’s share price took off at the start of September and it did so for a number of very good reasons. Removal of Large Oil Differentials – The combination of oil by rail and many different pipelines being built out across North America have eliminated the wide discount between the oil being produced in the Bakken and the oil produced globally. The market can now see clearly that the oil backlog at Cushing is being drained and is willing to believe these Bakken producers are going to receive better prices going forward. Predictable Growth / Increased Operatorship — Triangle had experienced very choppy production growth as the company took control of its field operations. Since the start of 2012 the company has gone from operating 0% of its production volume to operating 70% of its production volume. That is a big and important change. Increasing operating control is a big deal, because the market values operated production at much higher levels than it does non-operated production. Being operator gives a company more control over its own destiny. Operatorship provides control over the timing of spending and the quality of results. That choppy growth has started to become smooth and predictable, the market loves that and is rewarding the company. Triangle’s efforts to vertically integrate its operations made for some short term indigestion in pursuit of long term benefits. Now the market is starting to see that the integration is working and the unique advantages Triangle has because of it. Downspacing! Downspacing! Downspacing! – The 800 pound gorilla for these Bakken operators is that the play keeps getting better. Downspacing involves drilling more wells per section of land–which increases the amount of oil that can be recovered–and therefore the value of that land. Triangle’s recent downspacing tests indicate that the company can drill 6 to 8 Middle Bakken wells per 1,280 acres (2 sections, or 2 square miles) spacing unit with “no communication.” What that means is that Triangle has found that adding more wells does not lessen the amount of oil that can be produced by the original wells. While it is still early days, it does look like Triangle could drill twice as many wells and recover twice as much oil than it expected to from its core acreage in Mackenzie County. Montana (Station Prospect) Looking Interesting — Things are starting to get interesting in Montana as the industry has been drilling all around Triangle. Companies that have drilled wells in the area include Continental Resources (CLR), Southwestern Energy (SWN), Whiting Petroleum (WLL) and Samson Oil and Gas (SSN). All Triangle needs to do is sit and wait for one of those companies to reveal that they have “cracked the code” on the play. Once someone figures out how to drill profitable wells, the play goes from just having potential to being the real deal. Acreage land values will then increase by multiples of current prices. For two years the stock market has not been focused on just how good things are going in the Bakken for Triangle and other operators. It looks like the market is now waking up to what these companies have to offer. With oil prices just under $100 per barrel, the Bakken is going to keep on booming, and so too should stock prices for Triangle and its competitors.